Most of East Clandon to the north of the A246 falls into the Conservation Area. The Conservation Area is defined as the area within the blue dots on the map below. an interesting or important social history. A reminder to all residents in the Village Conservation Area that particular planning restrictions apply to your property. Your Parish Council encourages all residents of our village to be aware of these rules which help to retain the individual character of the village. We recommend that you contact GBC Planning if in any doubt about work that you wish to carry out on your property. In summary, the restrictions impose the requirement for approval for extensions that exceed a 10% volume increase. They also restrict changes to the external view of a property such as the provision of hard surfaces, roof changes, installation of satellite dishes, changes in the colour of doors, gates, fences, tiles, timber and the exterior painting of previously unpainted surfaces etc. and importantly the protection of trees. The alteration, installation or replacement of doors and windows. Any alteration to a roof including roof coverings, rooflights and solar panels. Enlargement, improvement or alteration such as an extension, removal or changes to architectural features. The provision of a hard surface. The erection, construction, improvement or alteration (including demolition) of a fence, gate, wall or other means of enclosure. The installation, alteration or replacement of a satellite dish or antenna. Removing totally or partially walls, gates, fences or other means of enclosure. Exterior painting of previously unpainted surfaces or changes of external colour schemes, or covering walls by render or like finishes. We recommend that you contact GBC Planning if in any doubt about work that you wish to carry out on your property. 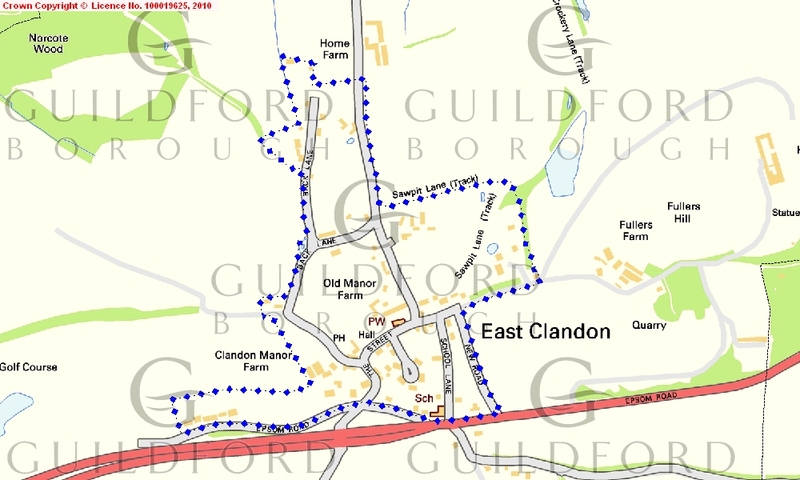 View the East Clandon Conservation Area Study and CharacterAppraisal produced by Guildford Borough Council.